Formerly know as PYJO 1a, this semi-professional band is filled with top high school students, college students, college grads & PYJO alumni. Formerly known as PYJO 1b, this advanced high school - early college level group focuses on improvisation, modern harmony & technical skills. Formerly PYJO 2a, this high-school - advanced middle school level band plays classic big band tunes, learns about improvisation & theory. A place for rhythm section players to study the art of comping, keeping song forms, voicing chords, soloing, learning the roles of other members of the band, interacting & communicating with each other. Formerly PYJO 2b. This advanced middle school band plays Jazz standards and fun big band tunes. They work on basic improvisation skills and often use planned out solos that highlight Jazz vocabulary. A place for talented younger musicians to learnPopular Rock, Latin, Jazz, Funk and Film Score Music. An introduction to how to take solos with volunteer soloists. Combo Sessions run 3-4 times per year - Between PYJO Sessions. These intense sessions have focused themes such as "Mongus" (the music of Monk & Mingus) or Post-Bop. A new class added in 2016! Which Band Do I Sign Up For? 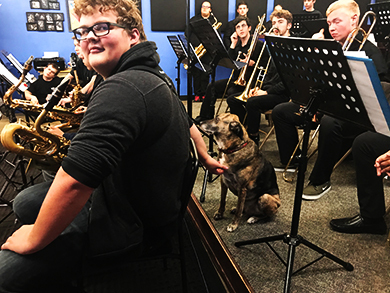 Private Lessons are available on Saxophones, Flute, Clarinet, Bass Clarinet, Trumpet, Trombone, Euphonium/Baritone, Tuba, Voice, Piano, Guitar, Bass (upright & electric), Drums. Also on any instrument wishing to study improvisation, composition or music theory. Contact us to connect with a teacher! This semi-professional band requires excellent reading skills. An emphasis is placed on the ability to improvise & play in various Jazz styles (Occasionally those new to Jazz are allowed in the band, but most new to the style are encouraged to Join PYJO 1). The directors are careful to choose players who have fine control of their instrument. They are looking for horn players with developed tones that can blend with other instruments, excellent intonation control & refined finger (or slide) technique. In rhythm section players, they are looking for strong comping skills, an understanding of harmony & strong motor rhythms to drive a band. The basic notes & rhythms on all parts are expected to be learned by the 3rd week of rehearsal. This top quality high-school band requires solid reading skills the ability to improvise & play in a Jazz styles is a plus. This band trains musicians to solo with a focus on modern Jazz styles ala Herbie Hancock, Woody Shaw, George Garzone etc while creating long lines & 8th note streams. Knowledge of 12 keys is required. This is a place for excellent high school and younger college musicians to refine their solo skills, tone qualities, intonation control, finger (or slide) techniques & comping styles. The basic notes & rhythms on their parts are expected to be learned by the 3rd week of the session so that practicing solos and instrumental technique can take priority. This outstanding high-school band (mixed with exceptional middle school musicians), requires good reading skills. 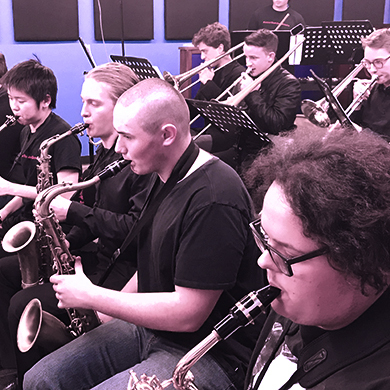 Experience in Jazz and/or soloing is a bonus, but not required.Focus is on Jazz ensemble playing while enhancing reading/rhythmic skills & developing Jazz style. Basic Jazz/music theory is mixed into the class when time permits. To insure a student is prepared for this class, they should be comfortable improvising (or willing to learn how). Knowledge of 12 major scales is needed as is the ability to read music in difficult key signatures with a variety of rhythms. PYJO 2 works on advanced ensemble techniques mixed with intermediate improvisation training. With a focus on interpreting chord changes and exploring creativity. An outstanding middle school Jazz ensemble. This is a technique building class. Students will strengthen reading skills, learn bebop melodies, work on projecting their sounds & learn basic to intermediate Jazz Improvisation skills. No audition or placement required. 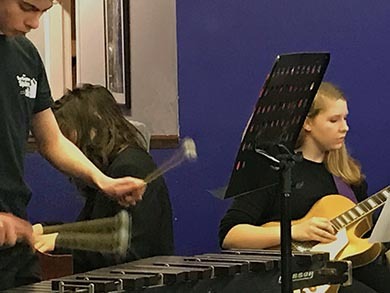 A place for talented younger musicians to learn popular Rock, Latin, Jazz, Funk and Film Score music. Each season challenges students to develop their musicianship, sound, technique and performance skills! At the end of the season, the PYJO Pops either has a concert or a recording session at the Burlingame Space with special guest artists. Recommended for 6th-10th graders (younger students with private teachers and band experience will be considered). Older students working on new instruments as doubles are always welcome! Open to: Piccolo, Flute, Clarinet, Bass Clarinet, Oboe, Bassoon, All Saxophones, Trumpet, Trombone, French Horn, Euphonium, Baritone, Tuba, Guitar, Piano, Electric or Acoustic Bass and Percussion/Drum Set. No audition or placement required.